Today is Ferret Day and many ferret owners will be celebrating with their wonderful pets. In recent years we have seen a decrease in the number of stray and unwanted ferrets and currently we only have 2 ferrets in need of homes at the GSPCA. If we just go back 5 to 10 years the GSPCA would often help over 50 ferrets a year and would often have 10 to 15 looking for new homes. 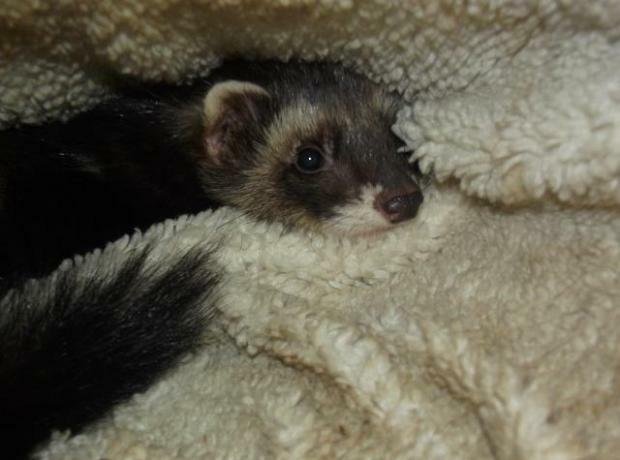 Currently there is just Whiffy and Tiffnay at the GSPCA two young ferrets in need. Both came in last Summer from the St Andrews area and are currently looking for new homes. Today is Ferret Day - are you celebrating with your ferret? In recent years we have seen a growing number of stray and unwanted ferrets and currently we have 6 ferrets in need of homes at the GSPCA. Over the last few years the numbers of stray ferrets being found has gone up each year and we now see over 40 rescued every 12 months with the peek time being through the Summer months. 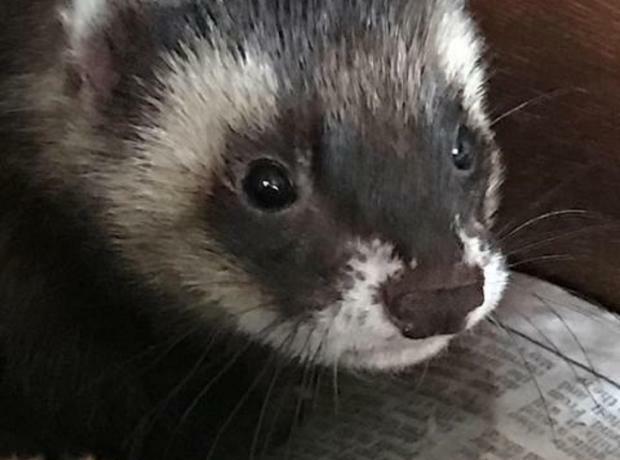 Our ferrets are neutered before rehoming and we also treat them for any other ailments they may have and we will carry out a home visit before they are homed. At the GSPCA we now see over 40 ferrets coming into our care each year. Most come in as strays and many are here for many months as we find it hard to find them loving new homes. 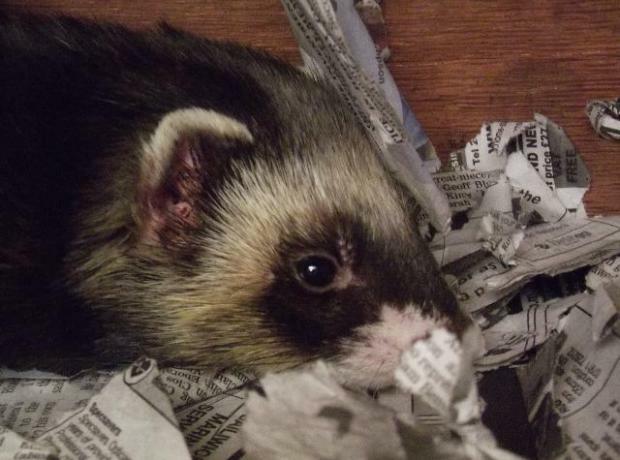 We were overjoyed last week when we had an enquiry from Alderney offering a home to ferrets. With nearly 10 in our care the gentleman popped over to visit those in our care and Little Man and Tobias took his fancy. 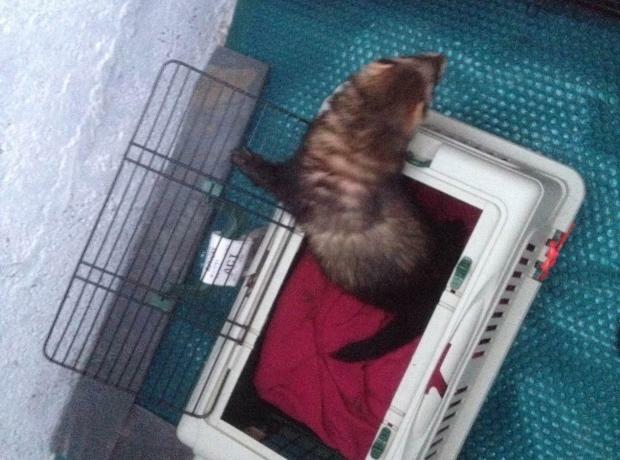 Both ferrets made the journey with their new owner and we have just heard that they are settling well. At the GSPCA we often get asked about dogs and cats looking for homes, but many forget the other pets in need at the Animal Shelter. In recent years we have seen a growing number of stray and unwanted ferrets and rabbits and currently we have 19 ferrets and 16 rabbits at the GSPCA. Some are still in their 21 days as a stray whilst we look for their owners or on treatment, but we do have 13 rabbits and 11 ferrets in need of new homes. Yesterday the GSPCA were called out to four baby Ferrets that were spotted in the middle of the road at Camp du Roi. The Ferrets after being rescued are now safe and sound at the GSPCA in St Andrews. Kiperling, Nancy, Albert and Wendy are having to be part hand fed by Shelter staff and volunteers due to their young age of only 5 to 6 weeks. The GSPCA has seen a huge increase in Ferrets this year and we have already had a number of stray youngsters through 2013. How cute is this stray baby ferret that was found cold and very weak? Earlier this week late on Tuesday evening a very kind gentleman spotted this little fella at the side of the road in the St Saviours area. Andrea as staff have named him at only just over a month isn't even old enough to be away from his mother and is needing bottle feeding by Shelter staff at the GSPCA. Andrea arrived late in the evening and GSPCA Manager Steve Byrne accepted the young ferret who was very cold, weak and quiet. A pen was quickly set up with additional heating and Andrea thankfully pulled through the first night well. Meg and Tyve (pronounced Teeva) came to live with us on 28th May 2011. They were daunted by the all the new sights and smells but slowly they're settling in. They get so much attention from our friends, they're turning into spoilt little fuzzbugs!